Well hello and thanks for coming back this week! 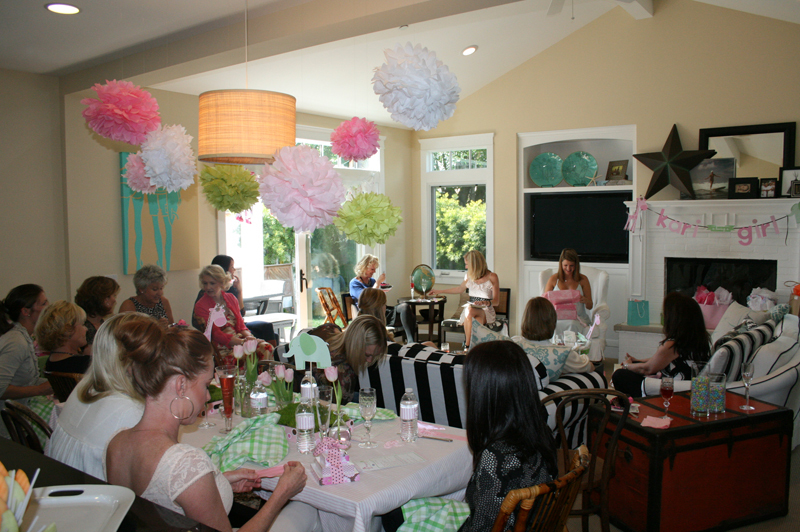 I’m thrilled to share the details of my beautiful sister-in-law Kari’s shower that my mother-in-law Sally and I threw. Let’s get this party started! Come on in… …and take a load off! 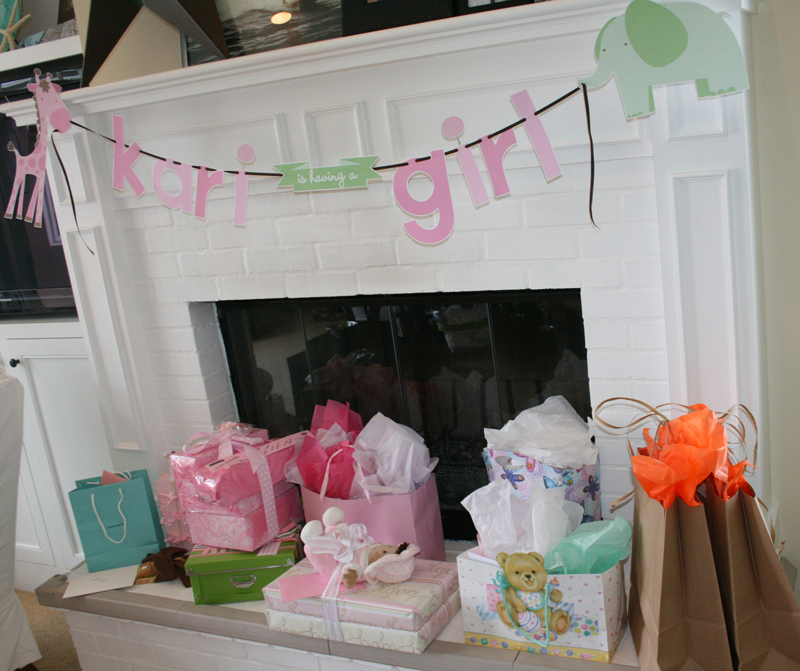 Kari made it really easy on us when it came to themes! 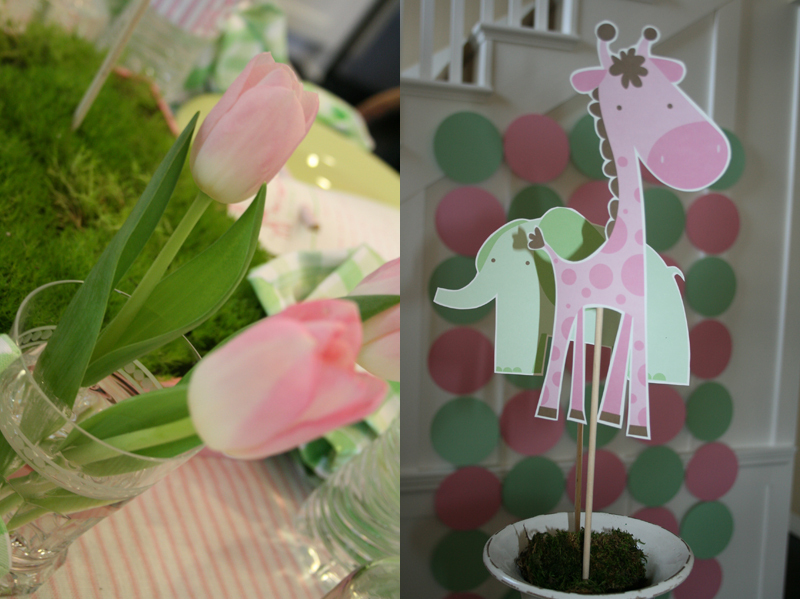 She wanted pink & green giraffes & elephants with a little brown thrown in for fun, but no animal print. Wish granted! 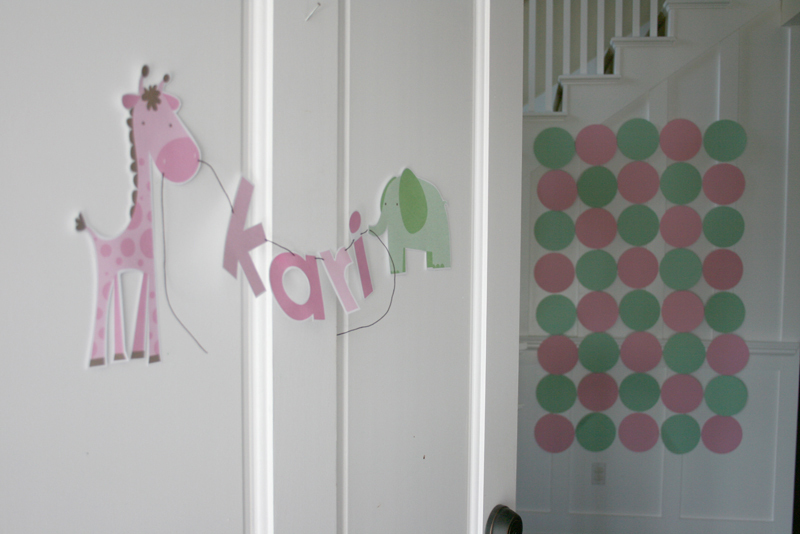 What a fun idea we got to work with… and we didn’t even have to use our brains! Hooray! 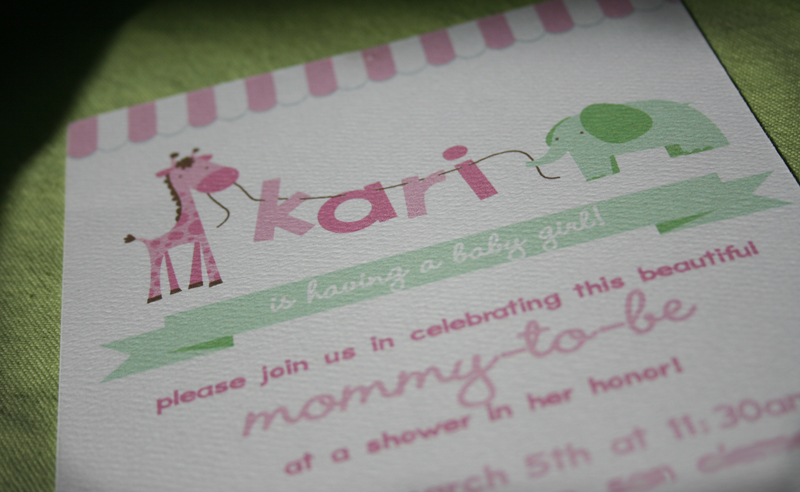 I designed the invite with her name strung between a pink giraffe and a green elephant, then used and abused the graphic in all the party decor. Oh and hey! Notice something familiar? Yep! 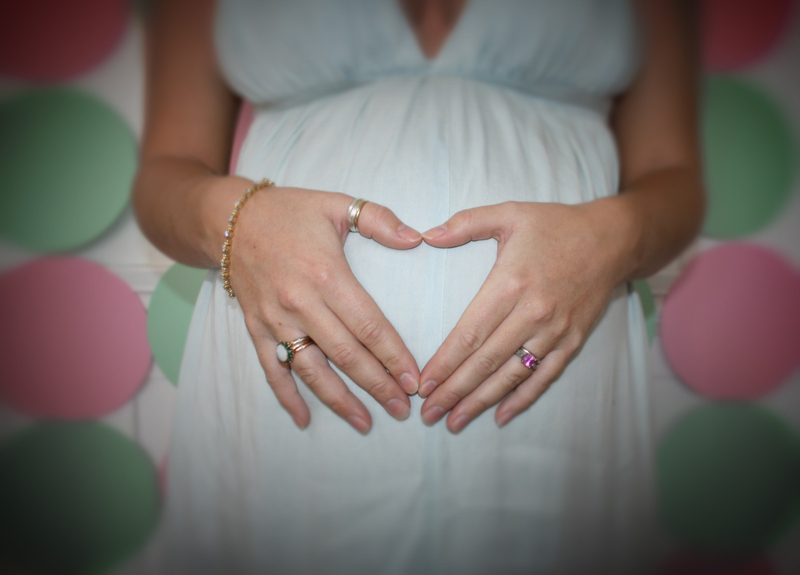 Told you I’d steal that circle backdrop idea for some photo ops. Just 8″ paper circles strung together. It turned out darling and we got some great shots of all the guests holding little animals. How pretty does Ms. Kari look? 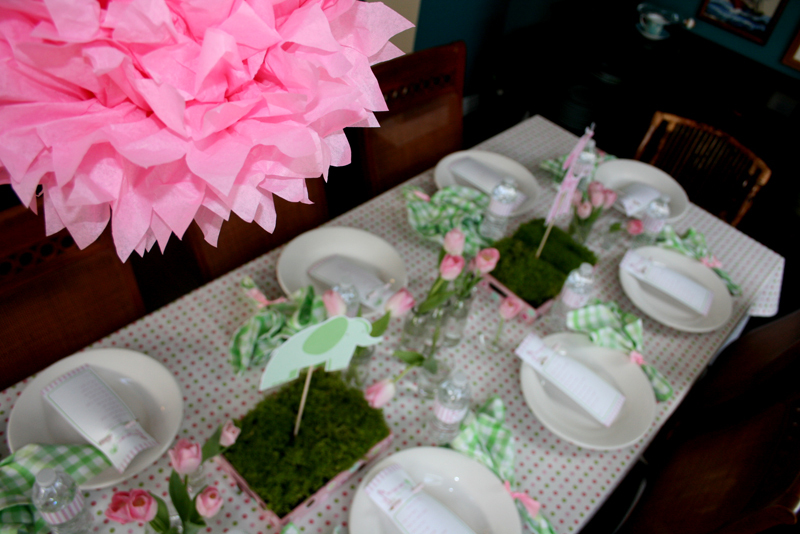 The three tables were explosions of pinks and greens. 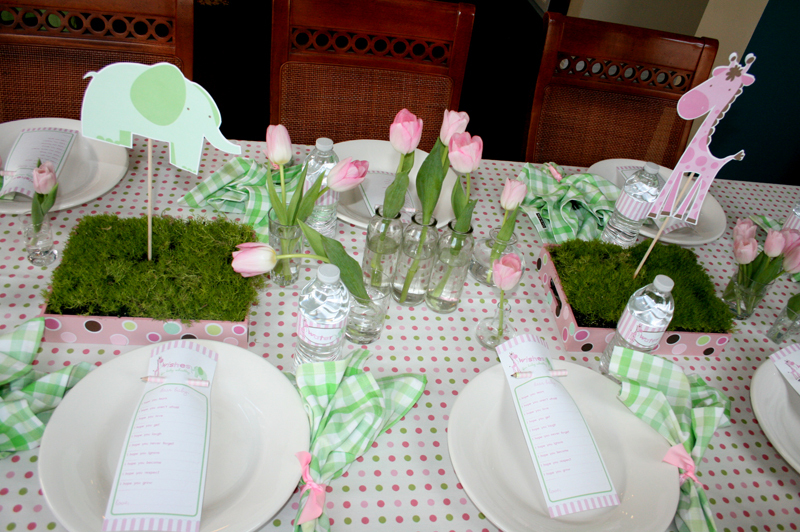 I filled pink wood boxes from Target with scotch moss (but would also look darling with wheat grass) and added the animals on dowels to keep with the theme. 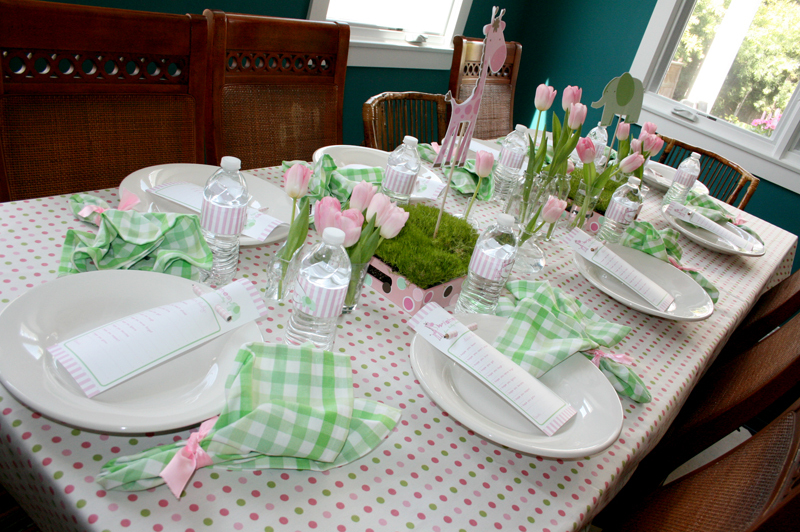 Tablecloths were made from fabric from a discount fabric store nearby, bud vases were either mine or stolen from my mom, and to keep things fresh, we stuck with one color tulip (pink of course!) from good old Trader Joe’s. 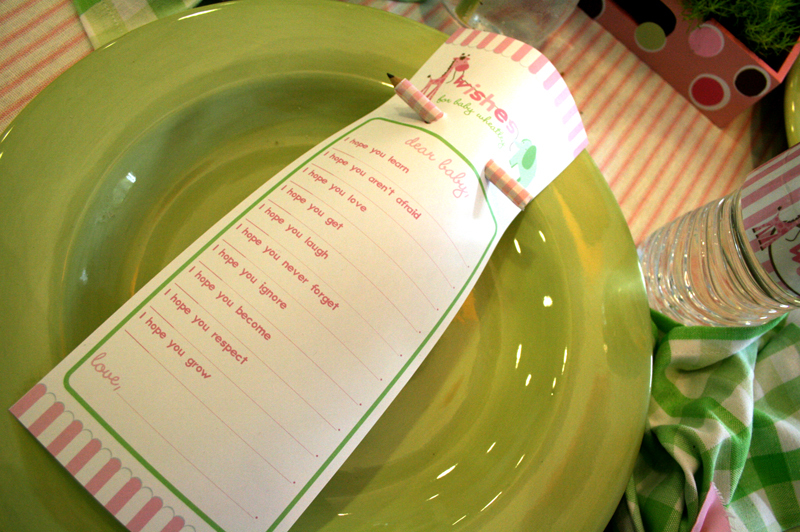 Sally found those sweet napkins at Sur La Table and I added the “Wishes for Baby” game on each place setting. The guests filled them out during lunch and I think this was the best way this game has worked… everyone actually filled one out. 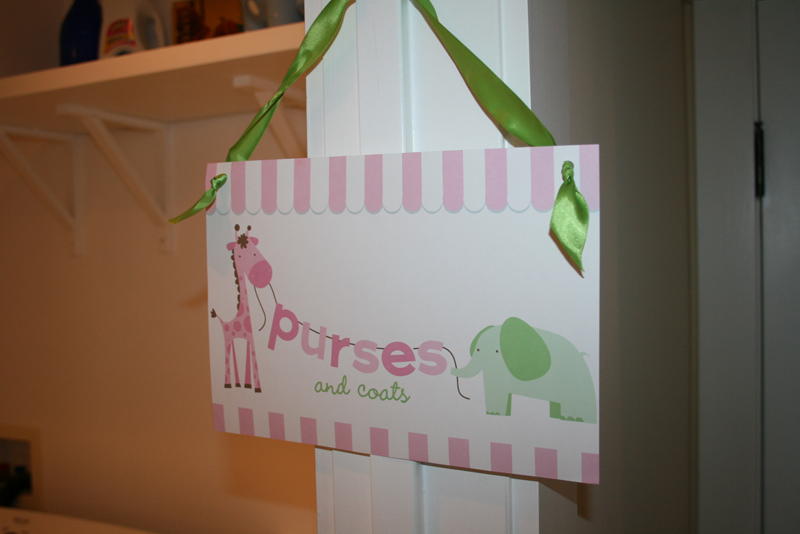 What a cute keepsake for the mom-to-be. (Oh, those pencils? Just golf pencils wrapped in wrapping paper and taped. We just couldn’t let ‘ugly’ into the house.) 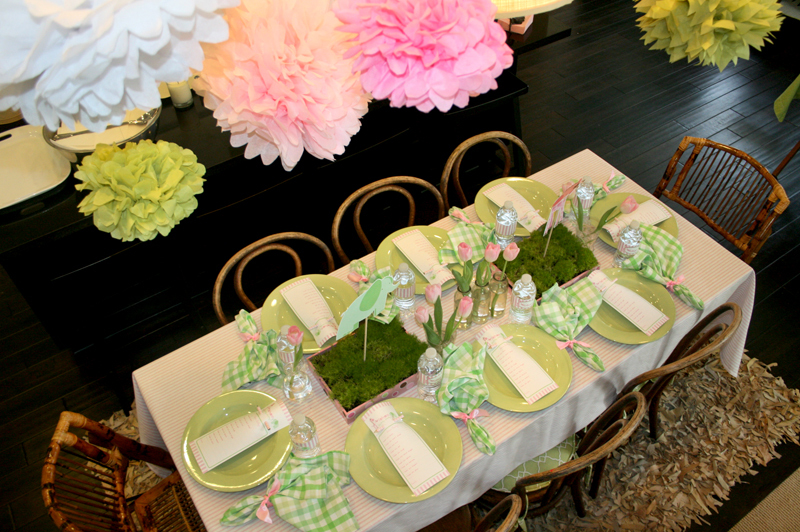 Each table had different tablecloths and plates yet it all tied in color-wise. I think it’s nice to mix it up a bit and not have things so matchy matchy as long as it still reads like the same party. 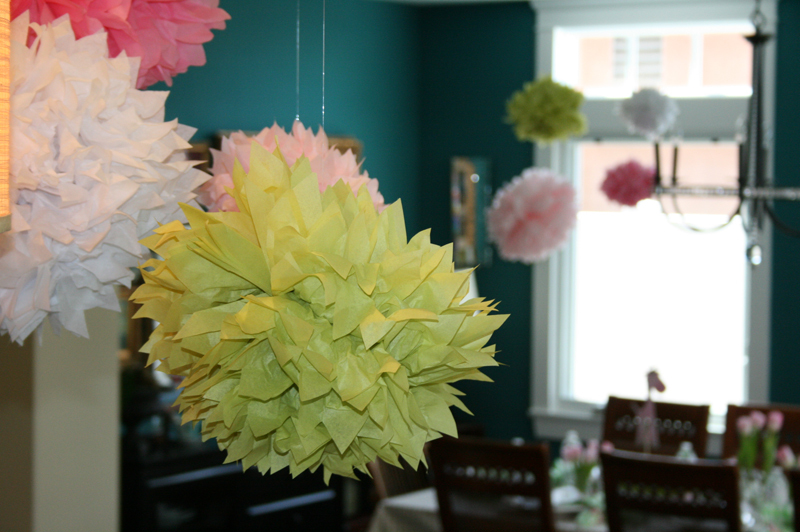 And though I am kicking myself for not making the poms hanging over head (I got them on etsy), they sure made the party look adorable. 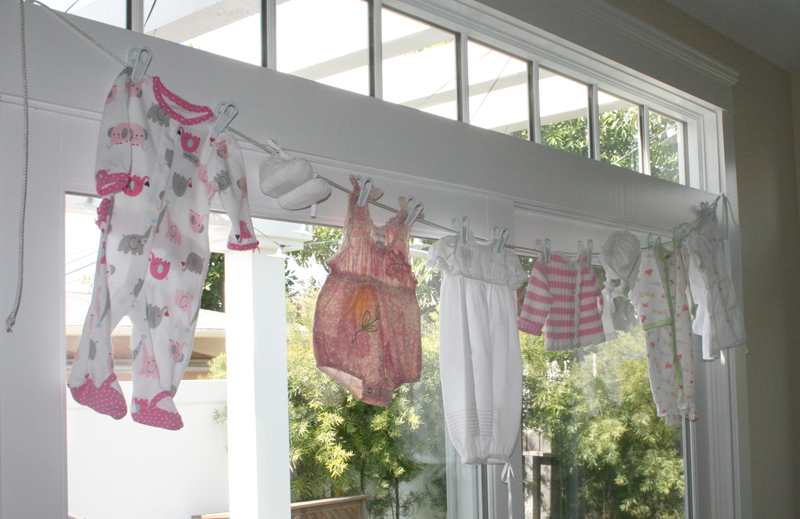 Stay tuned this week because I will show you how to make these things. It’s sickeningly easy! I think my 2 year old could make them. 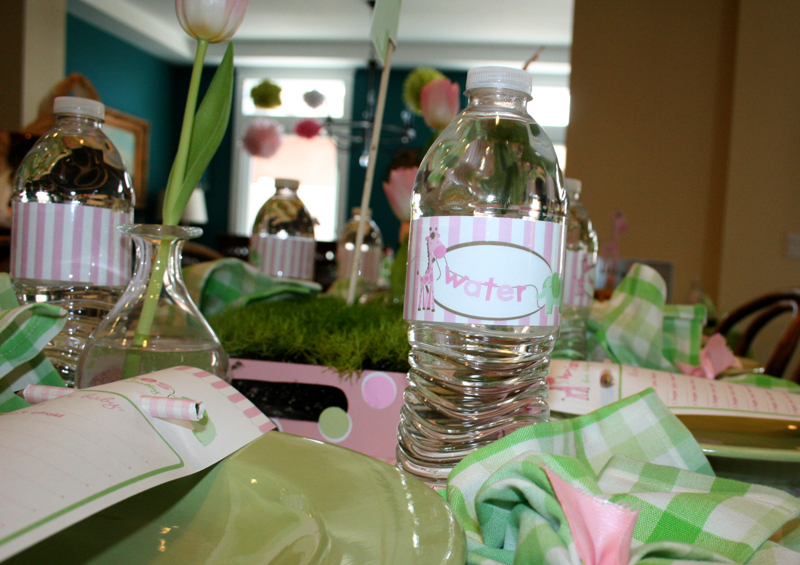 Okay, back to the party… I had to re-wrap that water bottle, of course… Sally found the cutest girly outfits for the clothesline… …and as the guests arrived, more gifts appeared… Let the fun begin! 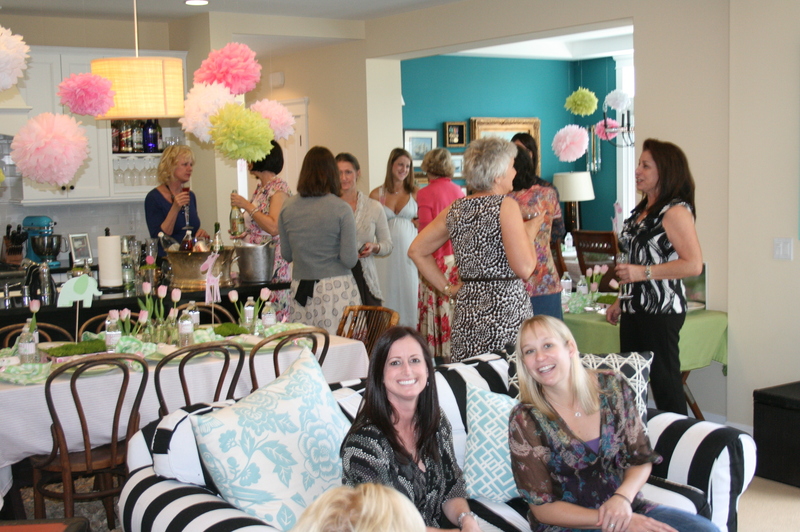 I loved throwing this party with Sally because she took care of all the food – which is why it was delicious! 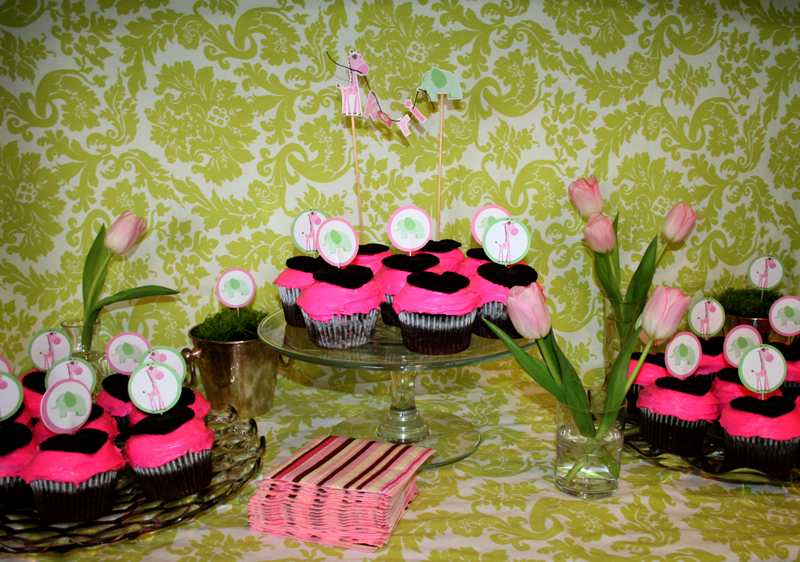 She also had these bright pink cupcakes made. Super fun. 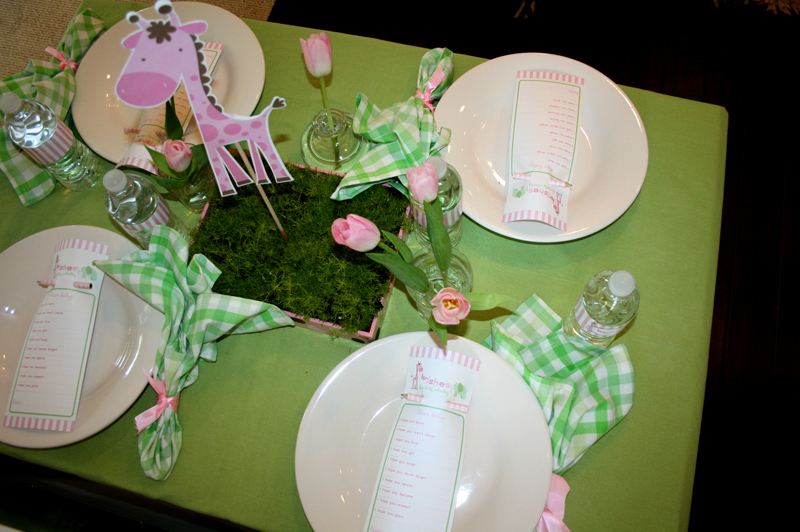 And again, I repeated the invite design again as a cupcake topper… The backdrop on the cake table was just a tablecloth I had laying around. 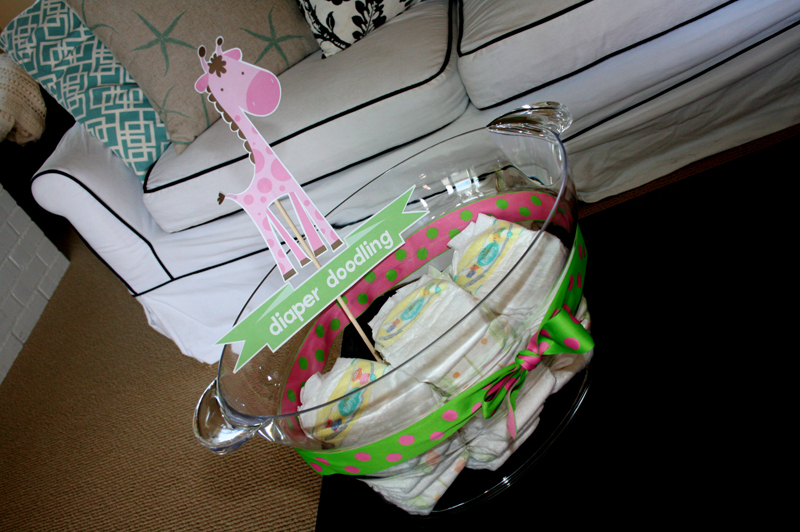 While gifts were being opened, guests doodled on diapers for Kari and ate those yummy cupcakes. 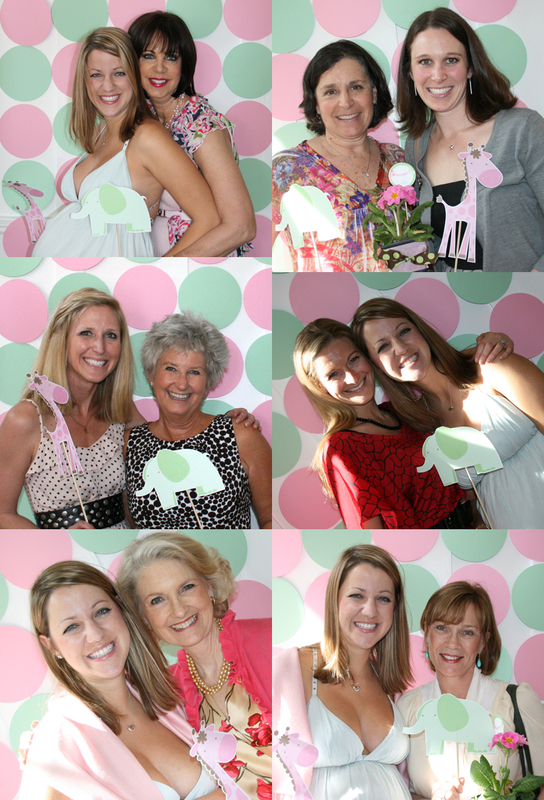 As favors, Sally came up with the idea of giving each lady a primrose. What a functional favor! I loved that idea. I wrapped the pots (again, no ugly allowed here! 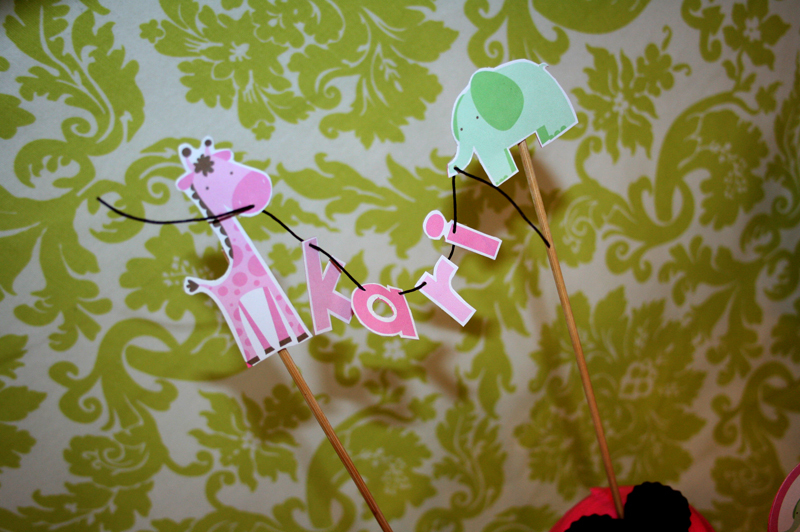 ), and added a skewer with each guest’s name on it along with it’s meaning. (Yep. My name still meant “Frickin Awesome.” Puzzling, huh?) 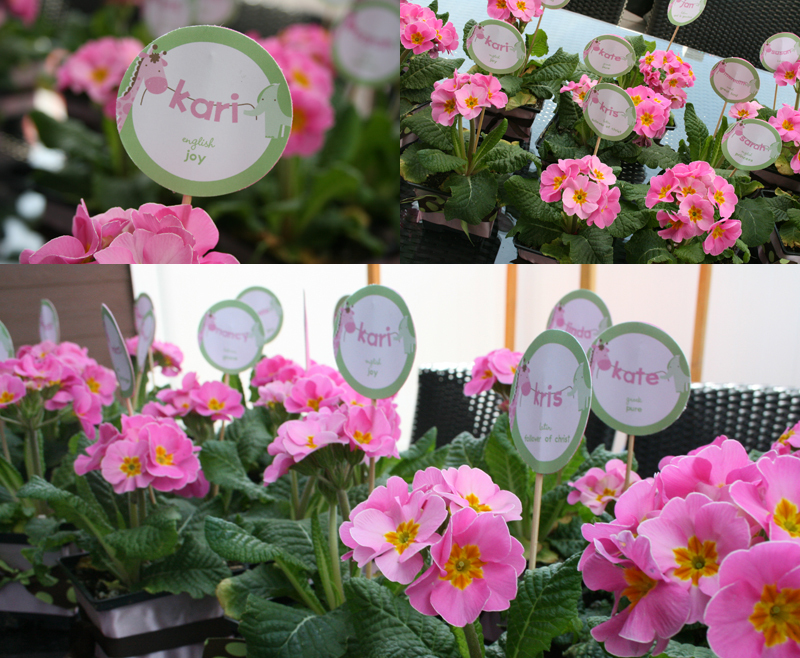 It was a day filled with insane amounts of love for our Kari! 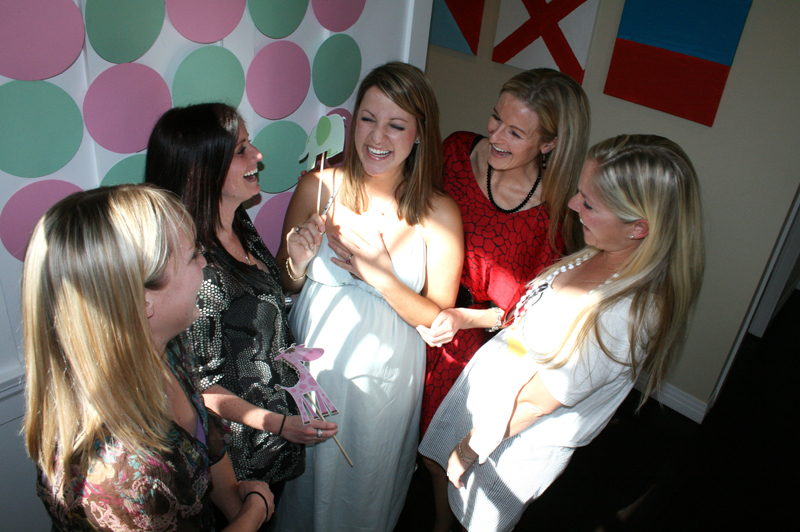 Her friends were all so sweet and she is a glowing mommy-to-be. 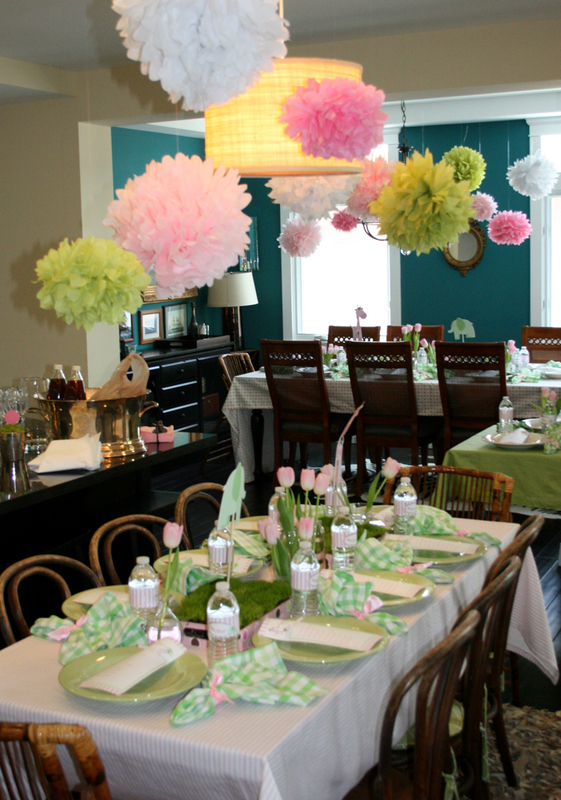 I hope that this party shows that even if you don’t have – or can’t go out and buy – decorations, or in this case, have a theme that would be challenging to buy decor for, you can still create a very cool and cohesive shindig. 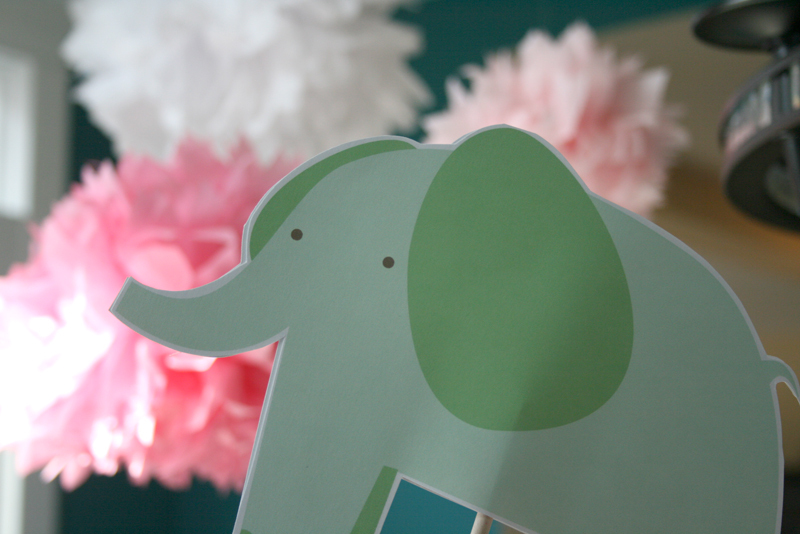 Using paper animals over and over again kept this party consistent, cute, and very DIY-able. It may take a little longer to put something like this together but as long as you’re patient with the scissors, you can recreate something like this very easily. And you’ll be able to pull it off with any possible theme you dream up. Thanks again for following along! Have a wonderful Monday! 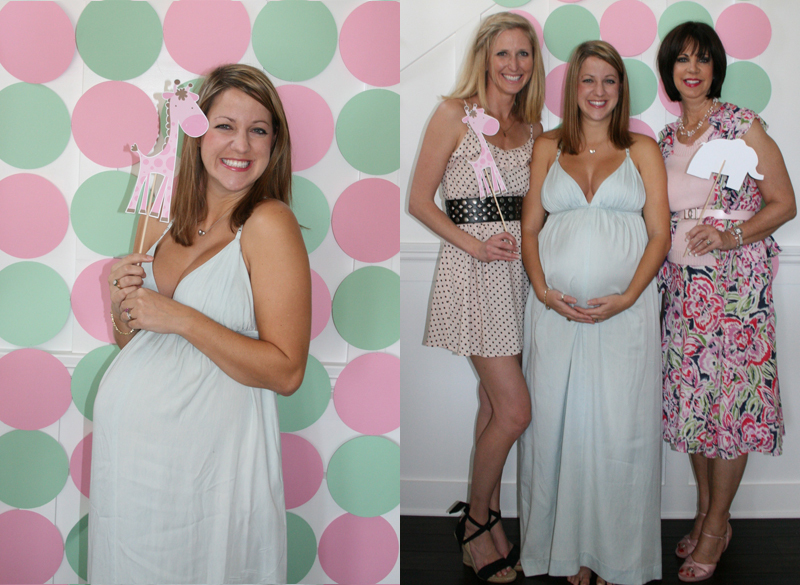 I’m co-hosting a baby shower for my beautiful sister-in-law this weekend and I can’t wait to share all the details! Be sure to check in on Monday. I’ll be posting all the fun!